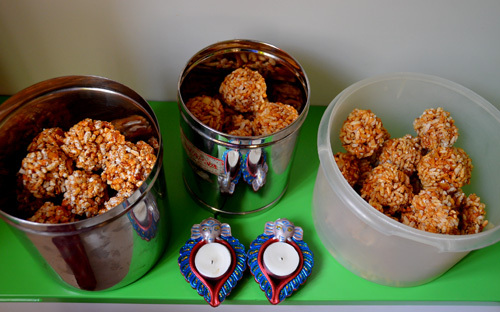 With the Diwali effect still settling down, we had the karthigai festival. In the south, this is actually the festival of lights (much more than Diwali). Lamps are lit all over the house and just outside. 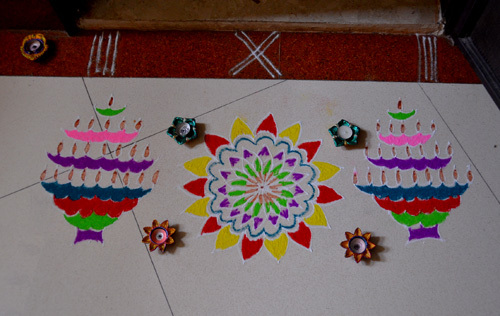 I reused all the lamps made during diwali and also made a diya-styled Rangoli. 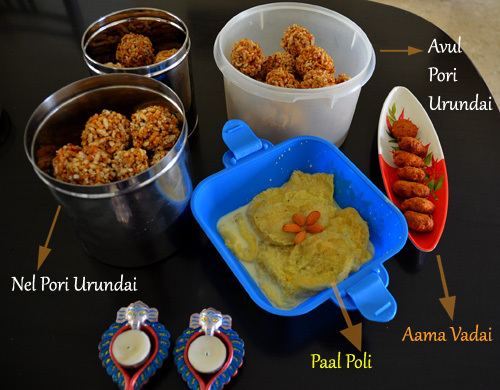 Four cups of puffed rice (called pori in Tamil) to be lightly roasted. One cup of jaggery to be heated with little water until it starts boiling to a sticky lava-like consistency. A quarter cup of sugar is to be heated in a separate pan. As it just liquifies, add it to the boiling jaggery mixture. Once this consistency is reached, take it off heating. Start rolling it into balls and that’s it, the pori urundai is ready.